Everything about the original title is retained for The Last of Us Remastered, with some obvious upgrades. For a start, character models and environments enjoy a greater level of detail, with improved lighting and shadows added in for good measure. Draw distances are improved too, reducing a lot of the pop-in that marred the original software. Even a year removed from playing the game, the differences are noticeable. This is all aided by the boost to framerate, with Joel and his fungal friends now running around at 60 frames-per-second. It's always wonderful to see the framerate double in a game, as despite what some may claim, the differences are very tangible indeed. If one needs proof, just go into Remastered's options and lock the framerate at 30fps. Doing so improves shadow detail, but at the cost of half the frames, and frankly it's a ludicrous trade to make. Going from sixty to thirty makes for a noticeably inferior experience, and while I can play a 30fps game on its own, it's impossible for me to go so quickly from double the frames to half. Some light DualShock 4 features have been tossed in, with the touchpad being pressed to open Joel's crafting menu, the tracking light changing color according to Joel's health level, and the microphone simulating torch sounds and playing audio tapes. I am a sucker for the PS4's light and sound gimmickry, so it's nice to see them integrated here. As well as the main game, extras including director's commentary, costumes, and the downloadable Left Behind campaign are all included too, making this the definitive version of the game. It's certainly a great way to collect everything together, if you hadn't played the DLC yet. You can also enable a feature to take screenshots. An arrogant addition, if you ask me, but it's there if you want it. 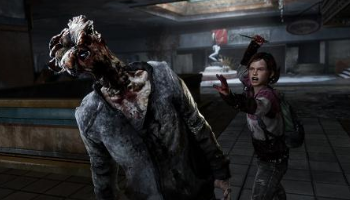 There's no doubt that The Last of Us Remastered looks gorgeous and has some lovely extras. However, just like with Tomb Raider: Definitive Edition, there's no escaping the fact that this is a do-over for a very recently released game, and if you already played it, the value of a lot of the experience is diminished. A lot of the same criticisms leveled at Tomb Raider must be shared here. At fifty bucks, this is somewhat costly for what is, ultimately, an upgraded port. Even so, the framerate improvement alone does a lot to justify things, and Left Behind is a more worthwhile inclusion than the stuff Tomb Raider came with. The overhaul feels a lot more significant, more than you'd expect for a game that's really not that old, and as such it may indeed be worth picking up, even for those who experienced the PlayStation 3 version. Still, as terrific as the game is, and as nice as the updates are, this is a port, and it does feel like more of a fresh coat of paint as opposed to an actual remaster. These are simply things one would do well to expect so as to avoid any potential disappointment. With preparation in mind, The Last of Us Remastered is a gorgeous looking improvement to an already delightful game, and while it's damn hard to justify repurchasing a game so recently released, Naughty Dog's done a way better job than most in that endeavor. Bottom Line: With its improved detail, better draw distance, and slick 60fps presentation, The Last of Us Remastered is a beautiful update to a beautiful game. It is, however, a rerelease of a game that isn't very old to begin with, and that bears taking into account. Recommendation: If you've already played it, I wouldn't say this is a day one purchase, but it may very well be worth checking out. If you're brand new to it, I can't recommend it enough.